We have started the second round of study of the Mastering Genealogical Proof in the DearMYRTLE Genealogy Community on Google+. I am again reminded, in the Preface of this book, about how many of us started in the study of family history. One thing I learned at the beginning was “Cite Your Sources”. I have done that, thankfully. I knew why, at the time, mostly so that I could answer the question “Where did you get that information from”? The first go time through this book, I learned lots. Mostly from the Conversation that took place with the Panel, and the Community as we worked through the book. So why am I doing it again. To learn more. Dr. Jones mentioned, in the preface, about being self educated. I got that one. But he continued about attending conferences to learn more. I can say “Been there, Done that”. I learn something every time attend one. Either a local meeting, of which I try to attend 2 different ones a month, and up to Roots Tech 2014. Each time, I pick up a GEM at each one. But my learning experience is now taking form by ‘teaching’ at two local senior centers locally. I am not sure that it’s as much teaching as it is sharing my experience. Without the tools, like this book, I would not have taken that next step. I learn from each class that I share. But the foundation is working through these home work assignment in my own way, based on the principals in this book. One of the questions that was raised in the book is about the word Genealogy. I have seen a number of discussions about a genealogist and a family historian. Is there a difference? Should there be a difference? If wasn’t until I was asked to give a presentation at a local Historical Society did I start to understand the difference. My thought was the methods that a Genealogist does in their research. I wasn’t there, that was for the professionals. I just wanted to get those names, dates, and places. I did that, BUT, what I realized was that I was capturing their Stories. The local Historical Society was capturing the story of the community, and I the stories of my families. For me it was a transition or the desire to find out who these people were and to try to tell their story for those that might follow. The genealogists do have their principals of how they “work” and this workbook spells out the Genealogy Proof Standard. The five steps! Only five steps???? Looking for all of the records that you can find. I have talked about that in the blog from time to time. It’s exhausting at times. But the trick that I learned between the MGP-1 and MGP-2 Study Group, is to go back and look at what you already have. After all, we / I have learned new “stuff” from the first time I looked at that record. I did cite all of my sources the first time, but were then detailed enough. Easy answer, NO. I am not a student, so I didn’t know how to cite correctly but my genealogy database program provided a feature to more accurately cite my sources. That lead to the next step, which I “sort-a” did. I knew when something didn’t look right, or appear right. But didn’t know why. Somewhere along the way, I learned that I needed to evaluate what I was looking at. Does THAT make sense? I don’t though the bad out, but know that the information I was looking at isn’t mine person, or something is wrong with that piece of information. The puzzle pieces don’t fit together. The next step is to identify and resolve conflicting information. One of my students taught me this one. We had conflicting information on what a persons name was. The son of the person with the conflicting information was in the room. We were looking at a census record when we saw the conflict, and the student asked me to scroll up the page and down the page. OK, I did. 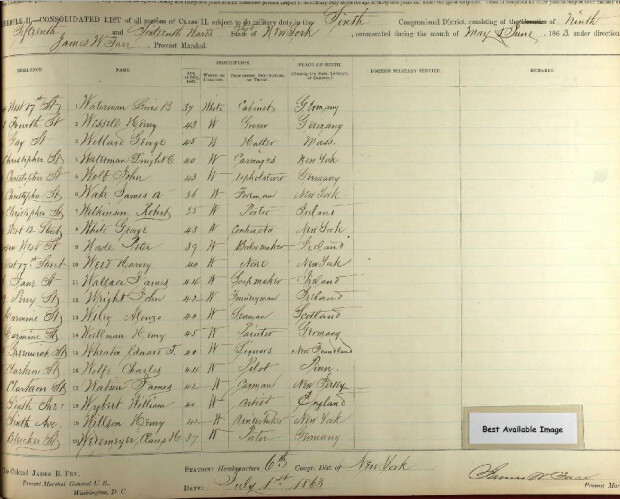 He pointed out that the Census Taker wrote everyone’s name the same way. Surname, Middle Initial, First Name. Easy resolution to that conflict. That resolution was put into the research notes for that fact, so that we knew that there was a conflict and how we resolved it. The last step, isn’t so easy for me, and that is to write up a proof statement. It’s that writing down of the conclusion of your research that is very important. Of course, that conclusion may change with the next piece of information that you find. I have that in my own research, where the “paper trial” says one thing, but DNA test results shows another. The most important lesson that I learned several times now, is the first step in this process. That is to have a Clear, Specific, stated Goal or Question to be answered. For me, to get there, I have found that I need to cycle through these steps several times. Testing our findings, comparing and contrasting this new piece of information against what I had before. One important thing that I learned / relearned this 2nd time through was the reminder that the jobs that I have had over the years, each had their own way of doing “things”. Standards of how we worked. Before I retired, I worked with a group that did this all of the time. We knew how things were to be done, we put measures in place so that we could tell if we were doing a good job, created plans to improve what we were trying to do. The real life learning experience has helped me with my family research. We could do lots of things really well, but other things, not so much. In our case it was the customer experience. The customer was seeing our overall performance, and would be the judge of how well we did. Our research is the same. Each step is related to the others. Researching very well, without evaluating that research, my not lead to the correct conclusion. I look forward to our continuing discussion on this book. 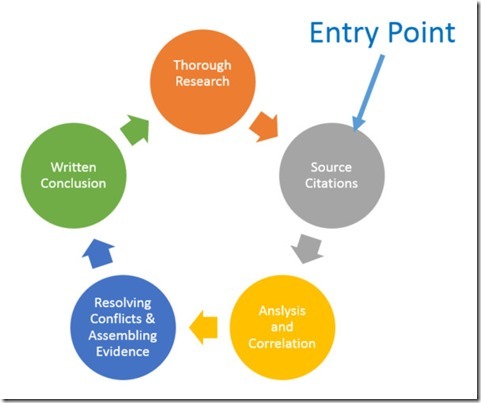 Mastering Genealogical Proof – And Suddenly the light bulb went on …. And Suddenly the light bulb went on …. Thomas W. Jones, Mastering Genealogical Proof , (Arlington, Virginia: National Genealogical Society, 2013), viii. A couple of the terms may be different, depending on who is presenting. Please understand that I am not saying that there is anything wrong with this, and in fact, I think it is very accurate. But, sometimes have issues with theories. Not good in higher level math classes. In taking courses when I would go to school for my job, some classes were a waste of time, especially computer software. The instructors were excellent, but they taught using examples that I couldn’t relate to. Today I was working on Chapter 5 of Mastering Genealogical Proof, when the Light Bulb Turned ON. (Can’t say “went off” based on some comments that were made with we were talking about Chapter 4, with Dear MYRTLE). I have been trying to understand where the genealogy software program(s) fit into this theory. The terms were also confusing to me. Conclusion? I’ll probably never have a conclusion on anyone in my family tree. That term to me, is the end of the line, I am done, I have concluded that …… Not in my life time. Slowly but surely, the study of this process has introduced a new way of thinking about what it is that I do. Somehow, from the very beginning of my research I heard “cite your sources”. In fact, back in the PodCast days, I probably heard that from Dear MYRTLE, and I am sure others. It didn’t take me be a couple of days to figure out why that was so important. I turned “cite your source” to “where did I get THAT information from?” I got it. The quality of the sources, not so much, but I could almost get back to where I found that piece of the puzzle. 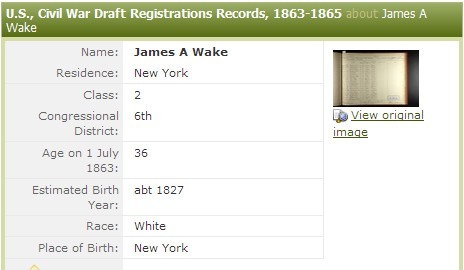 I have an almost 9,000 person database, pretty well document family tree that I can tell you where I got the information from, but the presentation of the citations left lots to be desired. Luckily Evidence Explained (Mills 2007) came out, my genealogy database software embraced what was included in that book, so I don’t have to worry, so much, about how to generate a credible citation. Spent most of 2012 reviewing and updating my Source information. Still have lots to go, but “working on it”. I am getting my genealogy database in shape, but now I am trying to understand this thing called GPS. Working through the steps seen earlier, I was trying to figure out where my program fit in. I also use two other Genealogy Programs, Evidentia and GenDetective, and trying to see where they fit in. 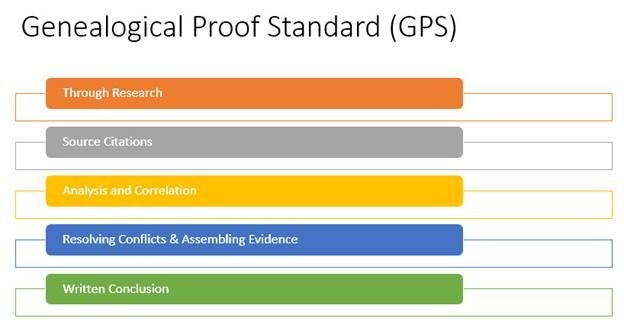 I think I had made a blog post earlier that I have no plans for starting over, but to pay more attention to the GPS process, and Evidentia and GenDetective fit into GPS, I think. I know that they both have already helped me in my research, but I was still trying to fit that linear chart above, into my day to day family research. Oh, not this made sense to me. It wasn’t linear after all, it was a circle. If I have written a “conclusion”, start around the circle again, find no more new sources to cite, I can stop going in the circle FOR NOW. That doesn’t mean that I don’t get back into the circle when / if I find a new source of information. Because as I go, I am writing as I go. Not just Citing the Source, which is what I had been doing, but spending time with it, writing down the analysis, and whatever follows Chapter 5, but I am guessing, especially that last step, Writing a Conclusion, will have some more work for me to do. I’m OK with that. BUT, it’s still a circle. Where do I START became my first question. 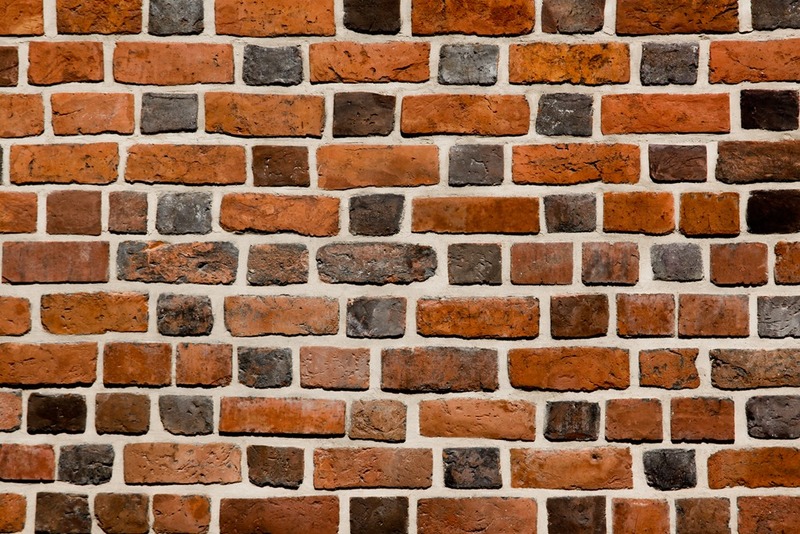 What if this was my chart: ….. Backing up to my homework for Chapter 4, that was the output of the Source Citation circle above. I may now have to back up to Chapter 4 again, to see where Evidentia, GenDetective and Family Tree Maker fit in. They are in there somewhere. 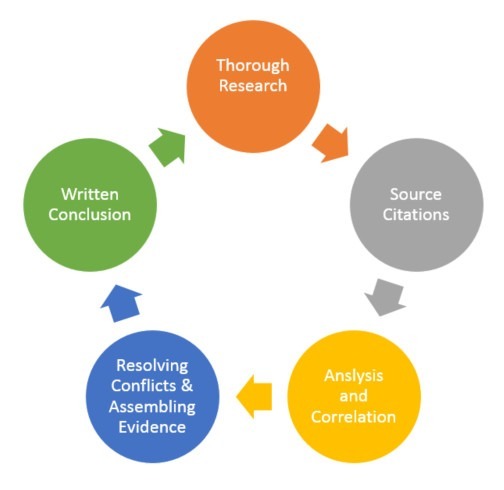 There must be a couple of more blog posts in there somewhere, to explain this process, as I understand it, so that my research can be improved. There was going to be a discussion about how to cite a Find-A-Grave entry in the Mastering Genealogical Proof Study Group on 21 July 2013, but the time ran out. This is not a homework assignment for Chapter 4, but merely how I handle this topic. There is a lot of discussion about the use of an “Index” or to Cite and index. What I have learned from this study of Mastering Genealogical Proof is that we should not use an index in a proof document. I totally agree with that. 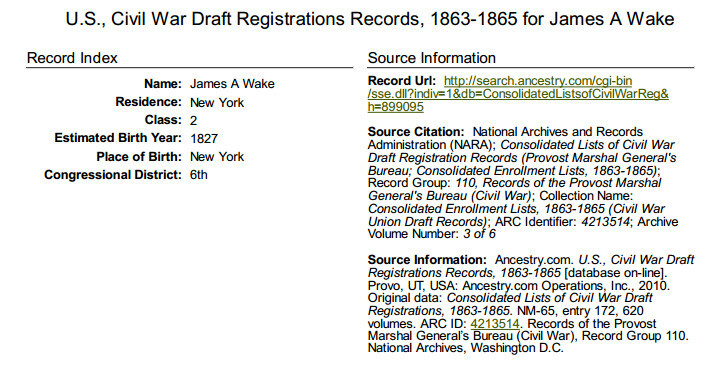 That said, it does not tell me that I should cite that, as a source in my genealogy datebase management software. I have chosen to do that and here is the format of my Citation, as created with the use of a Template in my program. 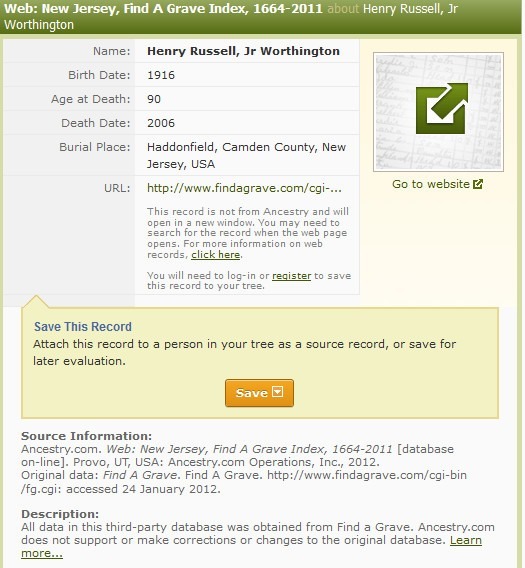 Ancestry.com Web, “New Jersey, Find A Grave Index, 1664-2011”, database, Ancestry.com (www.ancestry.com) Database online; accessed 20 Sep 2012. Index for Henry Russell Worthington, Jr.
Russ Worthington, “Find-A-Grave”, database, Find A Grave (www.findagrave.com) Henry Russell Worthington (1916-2006) – Find A Grave Memorial# 49480185; accessed 03/08/2010. That is using the same Template as the one from Ancestry.com. Perhaps the memorial number is not important here, but knowing the memorial number on the Find-A-Grave website, makes searching for, or getting directly to that memorial page easier. It’s a search field on the Find-A-Grave website. What about the photograph that is there? In this case, it’s mine and I could publish it in my Ancestry Member Tree, online at Ancestry.com. However, I have a policy for all of my Find-A-Grave photographs to mark them private in my genealogy database, so they will NOT appear in my Ancestry Member Tree. I can see it locally in my database, but not online.